Hey friends. How are you? It has been awhile, but I am writing this post because I am putting off going to gym. Today we have a special Texas themed post. 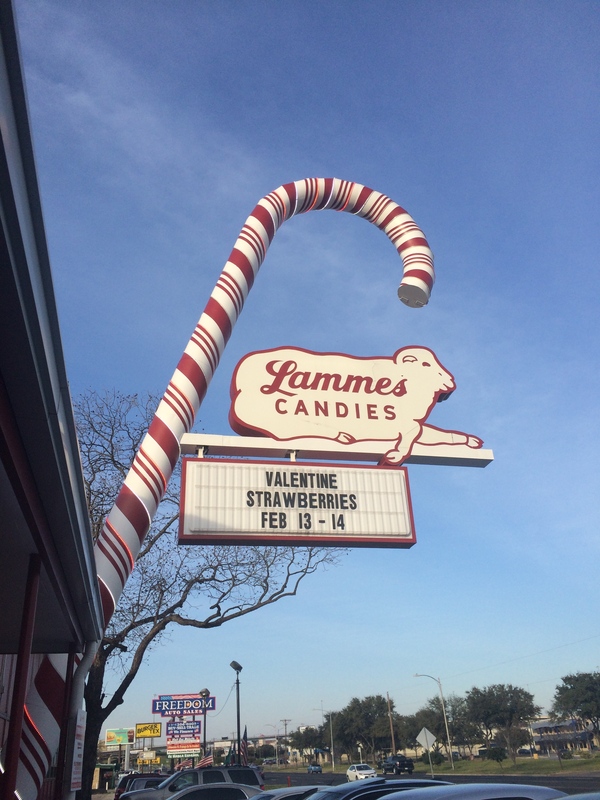 I went to Austin to visit my friend Lauren and we went to a Texas candy shop called Lammes and had some Texas wine. The cutest candy store ever, no? Some Cat with your Wine? 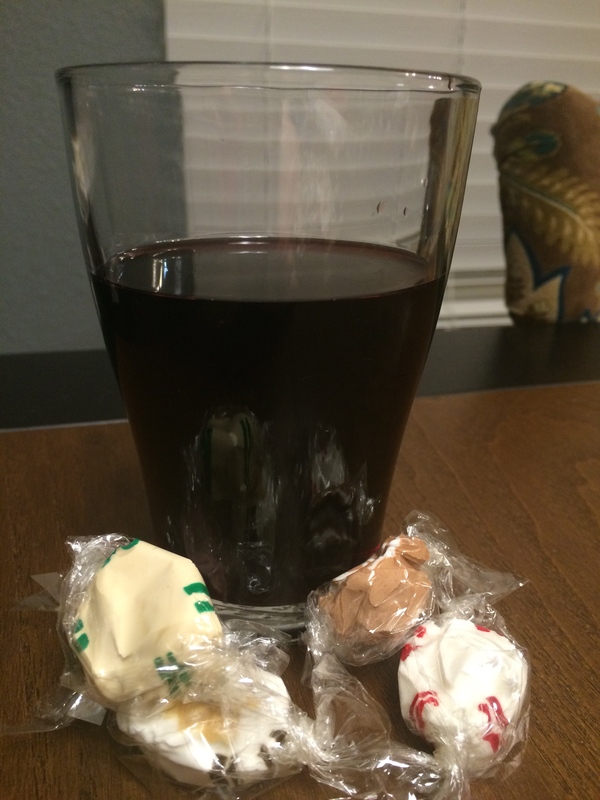 I chose the taffy because I knew I wanted a red wine. Taffy and white wine could be a bit too tricky since taffy is so sticky. 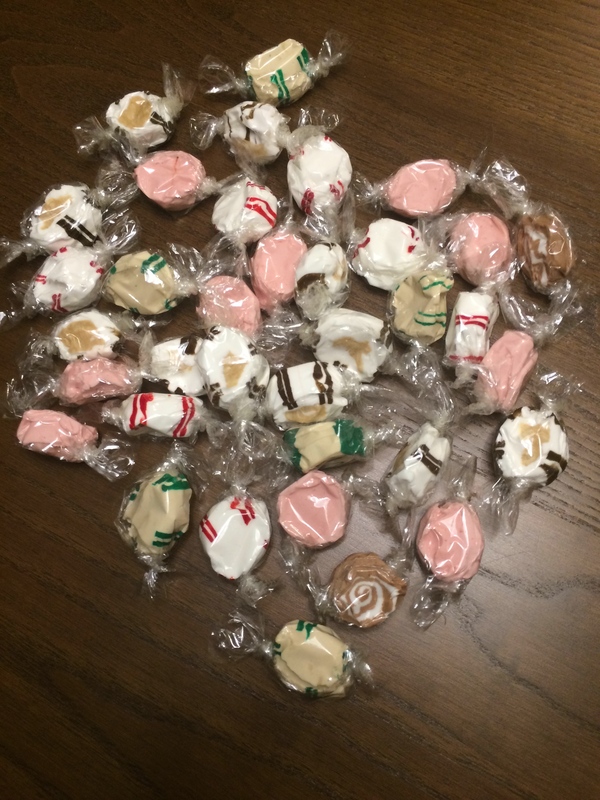 You may recall I have featured taffy before on this blog: here, here, here, and very recently here. I have learned you often want something to be able to wash that taffy out. I chose Merlot because the Fall Creek brand was recommended and we don’t include enough Merlot on this website. The wine is nice and simple with a mild flavor. There is a slight tanginess which is followed by a burst of sweetness on the tongue. Yum. Cinnamon: The cinnamon goes fairly well with this wine but the spiciness of the cinnamon numbs the tongue a tad. The wine is never thrown. This was the best pair of the selection. Molasses: This pairing is not good at all. I didn’t even write that many notes besides “not great” which usually means it is very bad. Spearmint: These flavors clashed and created an overall odd experience. The wine was thrown by the mint which is pretty typical. Peanut butter: The nuttiness battles with the wine’s sweetness. The taffy is too nutty to be enjoyable with the wine. Peppermint: Oh, this was very bad. It was way more minty than spearmint and the wine hardly came through. I want to note that I actually didn’t note carefully the taffy flavors Lammes was serving. I bought a mix and just interpreted the flavors while I was eating them. This isn’t science ok? I am not taking that many notes. Overall, cinnamon was the clear winner here! A fun time for all nonetheless. 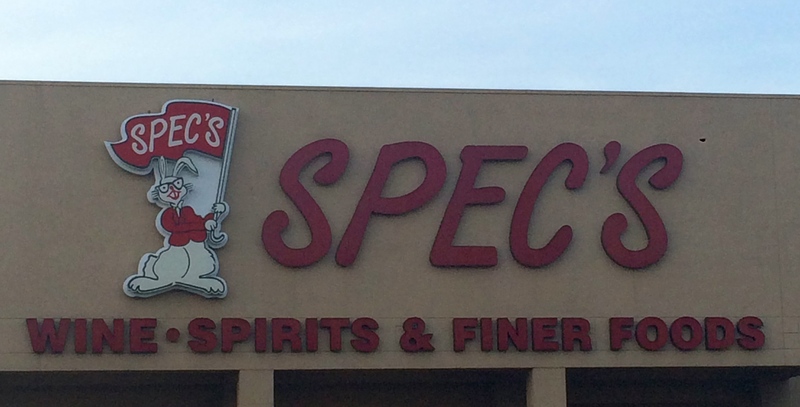 Thank you to Texas, Lauren, Lammes, and Specs! 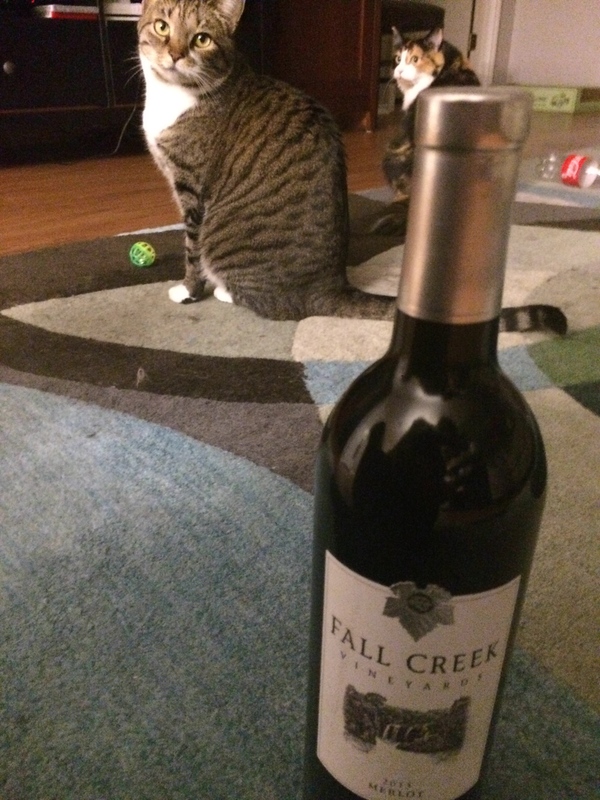 Posted in Merlot and tagged Candy, Cats, Fall Creek, Lammes, Merlot, pairing, Specs, taffy, Unbreakable Kimmy Schmidt, Wine. Bookmark the permalink. Happy 2015! Was your New Year’s amazing? Did you pair candy with champagne? Did you make resolutions that you have yet to even start? No matter what your answer, may 2015 be your year. I am enjoying the last few days before school and my new internship starts. 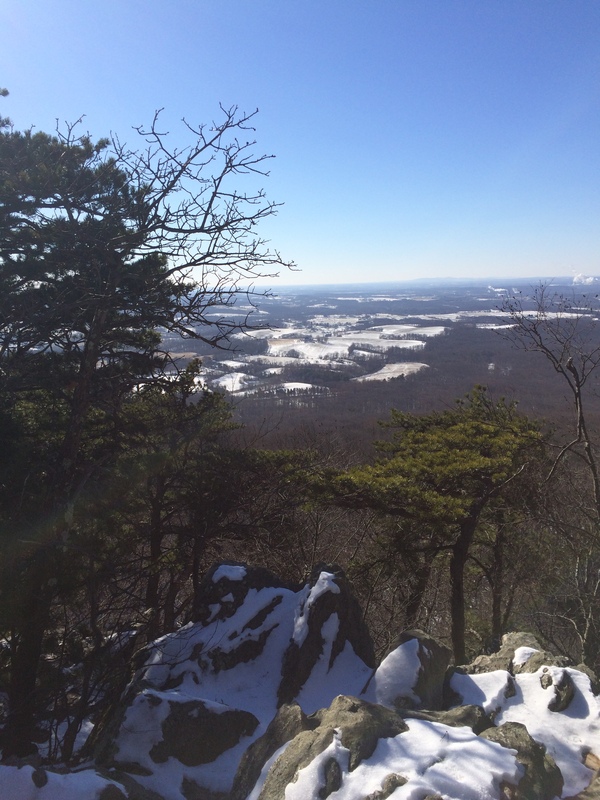 Yesterday, I hiked Sugarloaf Mountain in Maryland and then visited a nearby winery to enjoy a tasting and mulled wine! I didn’t take any winery photos, but here is a lovely view from the mountain. I have done a pairing very recently, which I am impressed by (it wasn’t even a resolution)! I got a lot of candy to pair for Christmas, so we are going to kick it off by pairing a classic on this blog, the candy that started it all: black licorice. The Dream: I typically pair licorice with reds, but I have not yet tried a Merlot. I actually was not that confident with this pairing, but I wanted to keep licorice pairings fresh. 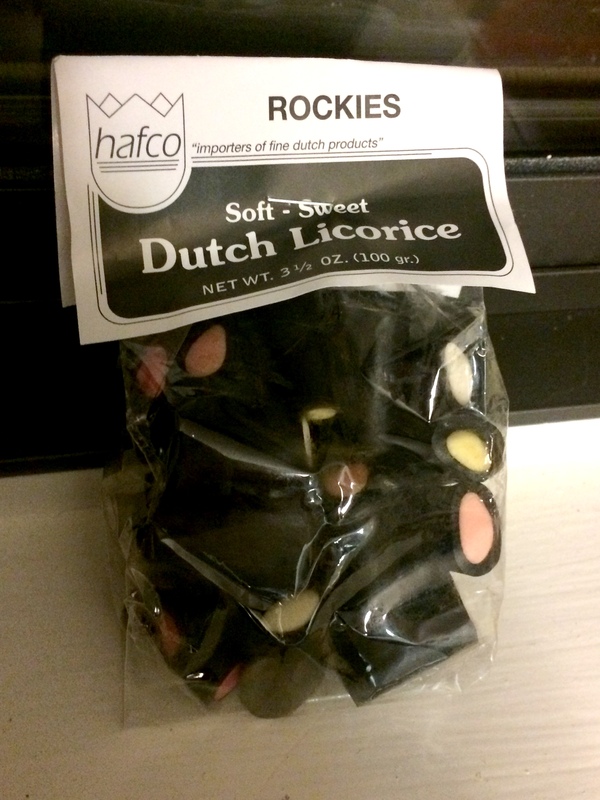 Also for some reason, I thought I had received salted licorice. Sometimes I really worry about my poor attention to detail. The Reality: I did not take a picture of this pairing and, unrelatedly(? ), I did not like this pairing very much. The Merlot did not taste good at first so I let it breathe awhile. However, it still tasted a bit watery and reminded me of weak coffee. Quite frankly it was not for my palate and I never grew to like it. The licorice is plain black licorice with a creamy sweet center. There was a vanilla and a strawberry center, but I could not tell the difference. I really tried to tell the difference but maybe my tongue has been burned too many times. I never grew to like these. Is there something wrong with me? Am I too negative? We will never know. The licorice slightly masks the odd coffee flavor. Again, I like coffee notes but this was just…wrong I don’t know. Overalldid not like this pairing. As the title suggests, I felt very “meh” at the end. While this isn’t the best way to start 2015, we can only go up from here! I have lemonheads and mini-mentos to pair in the near future. Posted in Merlot and tagged Agua Negra, Candy, licorice, Merlot, Sugarloaf Winery, wine pairing. Bookmark the permalink. I am about to go on another vacation. It will be short and sweet, but worth every drop. I have one more post for you before I shove off and it’s a special one. We paired the variety of Haribo we bought in Istanbul with a red wine, as I promised in my previous pairing with the wine gummies. It actually turned out pretty well! Don’t get me wrong, gummies are still difficult but this rolled alright. It helped that the flavors were more unique. That’s the Haribo way, I guess. 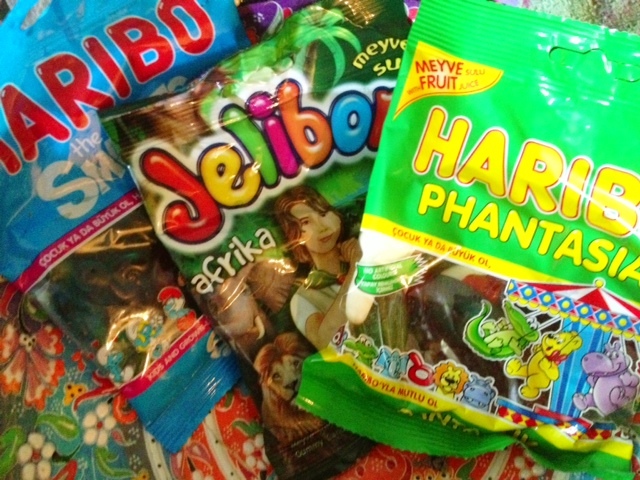 Yes Haribo. These are ALL candy categories alright. 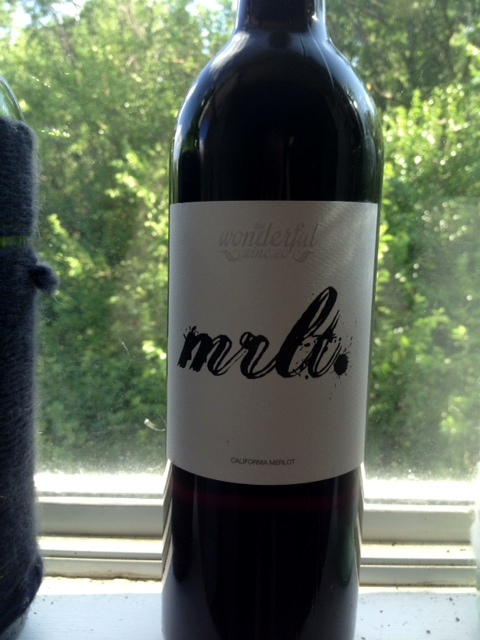 I just wanted to try something different, so I grabbed Merlot which doesn’t get a lot of play on this blog. It tends to have some bite but isn’t overwhelming and not too fruity. I thought it may go well with the fun fruit flavors. But honestly, I wasn’t sure. I got lucky (or is it SKILL?). We did this pairing while watching the extended version of Return of the King (…yea) so I didn’t take notes on the wine flavors! This is a huge offense and I apologize. But the wine was quite nice! Let’s break down the pairing by gummy. I paired a yellow gummy that was alligator-shaped and had white stuff on the back. Predictably, it tasted like lemon but the white stuff on the back gave it a strange stale flavor. It wasn’t altogether unpleasant, just strange. Paired? Not so great. Lemon is just never great with wine in my experience. The wine goes tart and gets very harsh. This particular pairing was not successful. I don’t know why I bought these, because I hate the Smurfs. I find them annoying and frankly suspicions. But they paired really well. They had a nice, tart blueberry flavor. It is uniquely blueberry and not the vague Berry that so many gummies go for. The wine stays smooth and tastes quite good. Would I gobble and drink til I can’t see straight? Maybe not, but it doesn’t upset me either. This citrusy gatorhead-shaped gummy actually stays quite smooth. The Merlot is crisp and fresh. Overall, a lovely combination. 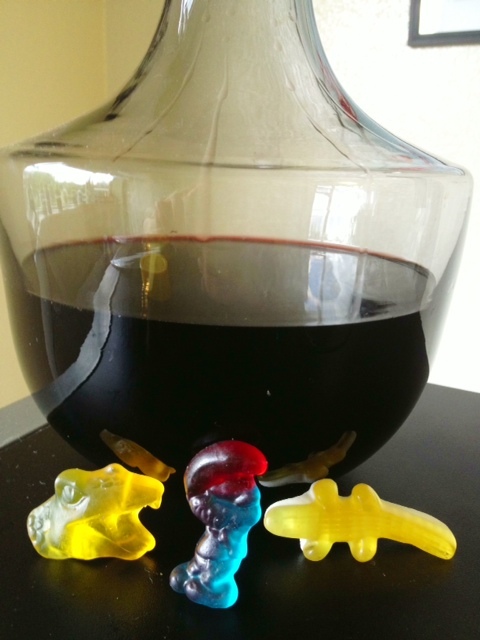 The Take Away: Gummy pairings have found a new savior, and her name is Red Wine. Yeah that savior is a HER, sorry fellas. Posted in Merlot and tagged Gummi candy, Haribo, Merlot, Wine, Wine and food matching. Bookmark the permalink. Don’t you love a late gift? Like the birthday card that came two days late or the Valentine’s Day gift you got two days after the fact? I know I do. And I hope you do too, because here is your late post. For Valentine’s Day, I wanted to do a special post dedicated to loving the Earth. Not because the Earth is a good thing. Not because I love the environment. Although both those things are true, I did it because the “Earth friendly” wine was pretty affordable. And that is how most themes on this blog are born! Despite the fact my boyfriend and I have been dating for almost 4 years, this is the first Valentine’s Day we have spent together. At first, I thought I would make it super romantic by creating an enormous dinner. But since I work and get tired, this did not come to pass. I did make a kicking chili and we watched 21 Jumpstreet for two hours. So basically super romantic. All that romantic chemistry is super interesting for you, but that is not why we are here. We are here because of candy-wine pairing. And boy, do I have a bad romance for you all (and I mean vernacular bad, so you know, good romance). The Wine: Fetzer, The Earth Friendly Winery. California Merlot, 2009. Fair Trade Certified "Chocolate with a heart"
Like I said, price was pretty important to me. Because I don’t make that much money, and keeping this affordable is pretty important (I will have a Budget Themed one too guys!) The wine was about $10 and the chocolates were two for five dollars. Since this is a learning experience, I picked a wine I don’t try often. That was the Merlot. 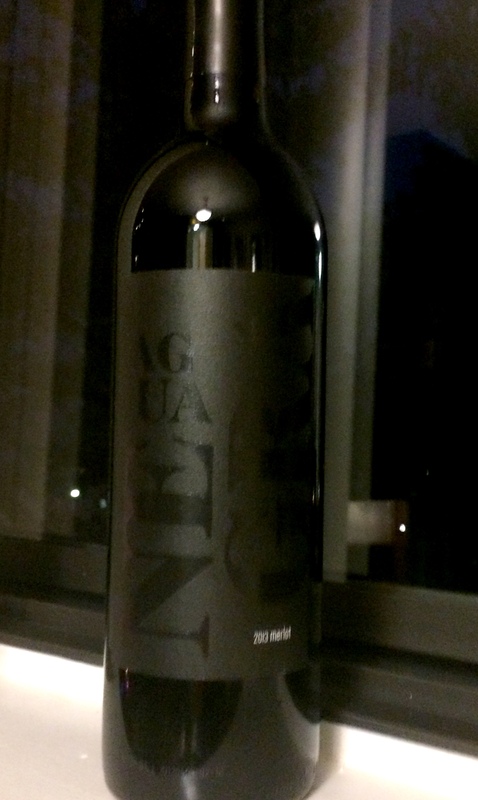 I have heard a lot of smack talk about environmentally friendly wines, so I wanted to find out for myself. Since it was Valentine’s, chocolate was a must. I decided, to keep with the theme, to try the raspberries (they are red, duh) but I threw in the fruit and nut to up my chances of success. Or failure. How ever you choose to look at it. The wine is very good. It’s sharp and challenging. The label said there were flavors of all sorts of fruits, but the blackberry really stood out for me. At first, I panicked. Is fruit going to wrestle with fruit? The raspberry dark chocolate was a perfect fit. The raspberry was tangy and it jutted out at the bottom of the chocolate. But the solid dark chocolate on top balanced the tang. It vacillated from a mild sweet flavor to sweet and sour, in the best way. It felt balanced and addicting. And like love, it felt so right. But the fruit and nut…just didn’t work. The chocolate was fine, but the fruit was too chewy and the nuts just left the mouth too dry. There was too much competition. There will be no second date here. But please, try these two specific brands of Merlot and wine together. It’s best for you and hey, probably ok for the environment too. I’ll be out of town for the weekend with the star of the Kitchen Whisk. Will we start trouble? Most likely. Will we blog? Not very likely. So enjoy your President’s Day if you are from the East Coast. If you are in the MidWest and don’t know what President’s Day is, then good for you. 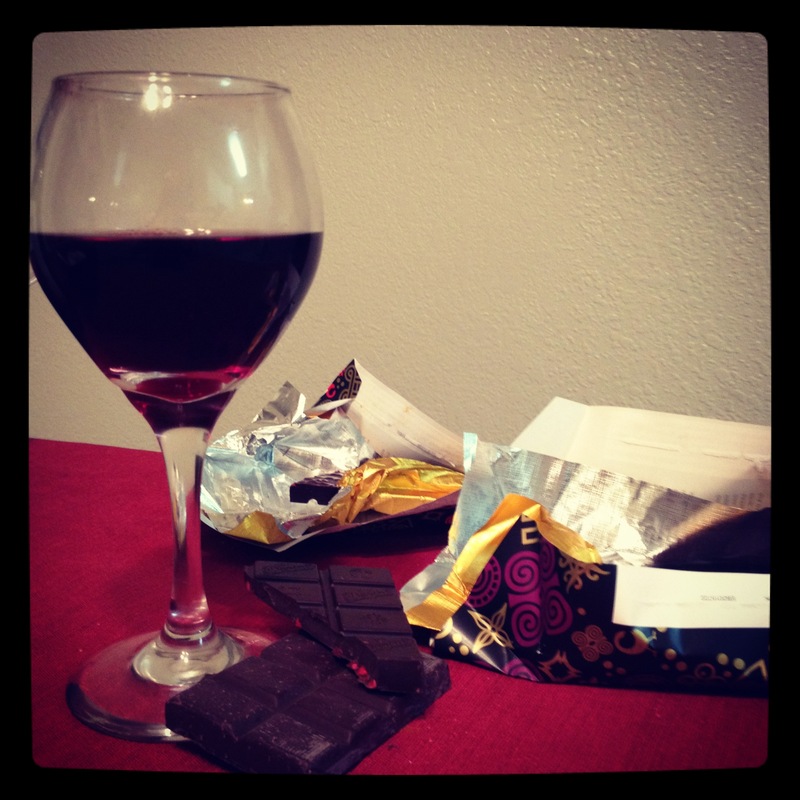 Posted in Merlot and tagged Candy, Divine, Earth friendly, Fetzer, love, Merlot, Valentine's Day, wine pairing. Bookmark the permalink.